Several heavy weight and senior political leaders who resigned from BJP and others including Minister and MLA have been given party tickets. 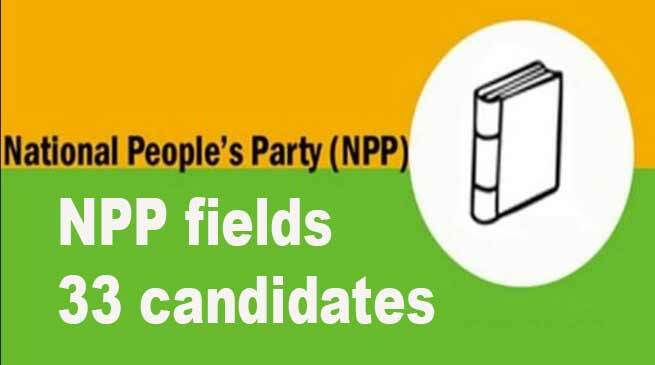 NPP state Vice President and Spokesperson Nima Sange Saling inform that though there were many prospective candidates for various assembly constituencies but Twenty nine candidates were finalised in first list while four names were finalised on Friday. Several heavy weight and senior political leaders who resigned from BJP and others including Minister and MLA have been given party tickets and many have filed their nomination and rest will file on Monday. Saling said. The prospective candidates who were nominated in first list are sitting MLA Mutchu Mithi from 43 Roing assembly constituency, sitting MLA and Minister Kumar Waii from 8 Bameng, sitting MLA Nikh Kamin from 48 Bordumsa-Dayum, Nikh Khopi from 48 Lekang, sitting MLA Tirang Aboh from Khonsa West, Tony Pertin from Dambuk, Danhang Phuksa from 55 Khonsa West, Retired IAS Tahang Taggu from 32 Rumgong, Jampa Thinley Kunkhap from 1 Lumla, Tsering Gyurne from 4 Dirang, sitting MLA Pani Taram from 21 Koloriang, sitting MLA Tapuk Taku from 10 Seppa East, Jarpum Gamlin from 27 Lirmoba, Shoney Pertin from 39 Mebo, Gokar Basar from 29 Basar, Karto Kaye from 36 Nari-Koyu, Tarh Hari from 15 Sagalee, Retired IAS Tarin Dakpe from 25 Raga, Rudham Sindhu from 23 Taliha, Porchu Tamin from 24 Daporijo, Aju Khonjuju from 7 Bomdila, sitting MLA Thangwang Wangham from 59 Longding-Pumao, Minister and sitting MLA Jarkar Gamlin from 31 Aalo East, Tori Ragyor from 33 Mechuka, Malin Angam from 47 Namsai, Iken Tao from 28 Likabali, Twang Lowang from 54 Namsang, and Khawang Rangsu from 57 Bordumsa-Bogapani assembly constituency. Salin said we released the final list on Thursday where four party tickets were released to the candidates are Nabam Vivek from 14 Doimukh, Kipa Kanye from 19 Nyapin, Tainam Jammes Jugli from 51 Nampong and Techi Tolu Tara from 13 Itanagar assembly constituency respectively. Salain said. Few candidates have filed their nomination and hope that all the candidates would file their nomination on Monday which is the last day of filing nomination. He added.